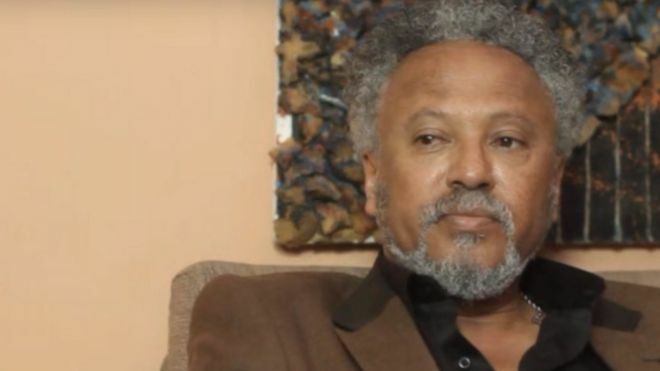 Prominent Ethiopian actor Znah-Bzu Tsegaye has sought asylum in the US after leaving the country about two months ago, he told Voice of America. The actor was in a weekly soap opera Sew Le Sew on state television. He left because of "repeated harassment and for being Amhara" reports the opposition Zehabesha website. Human Rights Watch says security forces killed at least 100 people at protests in the Amhara region in August but the government denies this. What is behind Ethiopia's wave of protests? In an interview with Voice of America's Amharic service, the actor said the Ethiopian security forces had carried out "atrocious actions" and he had decided not to return home until the "regime is changed". "It is sad to respond with bullets to people's demand for their rights," he added. At the root of the recent demonstrations in Amhara is a request by representatives from the Welkait Amhara Identity Committee that their land, which is currently administered by the Tigray regional state, be moved into the neighbouring Amhara region. The Oromo people in Ethiopia have also been protesting against the government, saying they have been excluded politically and economically. During the Rio Olympics, marathon runner Feyisa Lilesa crossed the line in second place with his arms above his head in solidarity with Oromo activists. He said he wanted to seek asylum after the high-profile anti-government protest, and he is now in the US.